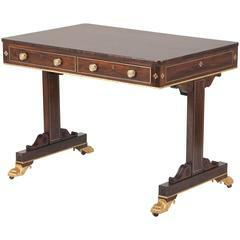 An English Regency period writing table from the early 19th century, with red lacquered, black and gilt chinoiserie decor and cabriole legs. Born in England in the early years of the Regency era, this exquisite table features a rectangular top with black writing area, surrounded by delicate gilt floral motifs standing out beautifully on a red lacquered ground. The apron, presenting the same contrast of red, black and gold colors, is adorned with chinoiserie motifs while the table is raised on unusual pronounced cabriole legs. With its graceful lines and refined décor, this English Regency period chinoiserie table, circa 1820 will bring an elegant touch to any home, perhaps placed in an office, living room or bedroom. 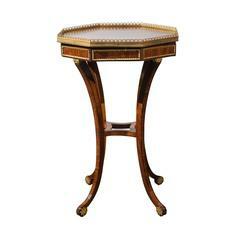 A rare English Regency period mahogany adjustable reading table. English, circa 1820. 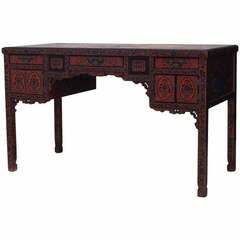 Nineteenth century English Regency desk composed of red lacquered coromandel heavily decorated Chinoiserie desk designed with a number of drawers and doors concealing storage. 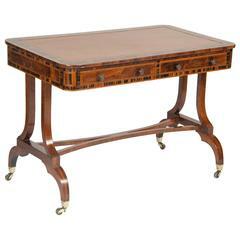 A very fine English Regency Rosewood library table in rosewood with gilt metal and brass quatrefoil inlay. Attributed to Gillows. 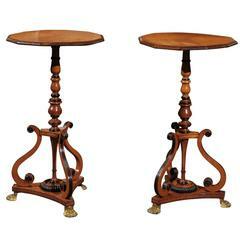 A Regency rosewood and calamander library table of exquisite form and execution.